Current and future science majors have a lot to be excited about. The Campaign for the Sciences has been in full swing since January, and they have met their first goal of $5.5 million through funds and commitments by generous individual donors as well as private foundations and corporations. 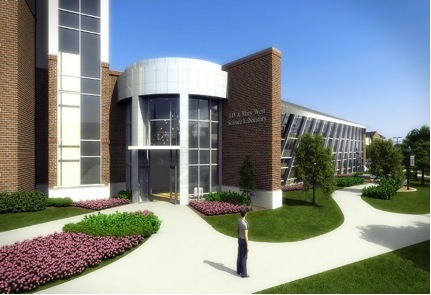 This $5.5 million was needed in order to begin the planning for Phase One of the JD & Mary West Science Laboratory. Phase One will consists of 25,891 square feet base building, including five biology laboratories (including a cadaver lab), three chemistry laboratories, two research laboratories, five office spaces, six student gathering areas, an open entrance area, and a greenhouse. Now that the funds for the first phase have been raised, the vision and plans of the new building have taken a leap from conceptual to actuality. During an in person interview, Vice President for Financial Affairs Dr. Scott Strawn said they are working on a hard timeline and hope to be making an official announcement during this academic year with details on groundbreaking and construction. Concerning how the construction of this new addition would affect all SNU students, Strawn said certain students might have to adjust daily patterns such as walking routes and parking. He hopes that the noisiest parts of construction will take place during summer or light times of the semester. Strawn also noted the importance of rewarding the Science Department for its excellence and said it is important to support the department’s continued growth. Strawn pointed out how profound it is that a Christian university is building a new science building. He believes it speaks volumes and says that SNU is not afraid of truths and discoveries in scientific development. Science majors will obviously gain the most from this new building. Chesney Burgweger, a Senior biology/chemistry major, is no stranger to the current science building. She has taken many classes in the science building and has been a lab assistant in both the chemistry and biology departments.